Canada Post - IYA2009 issue. 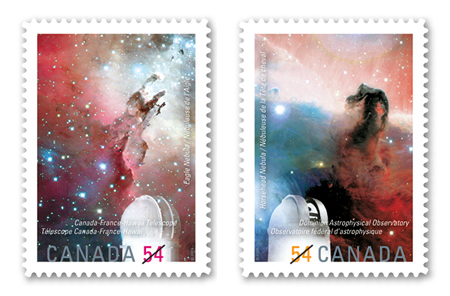 Canada, two stamps (each valued at 0.54 CAD) feature an observatory set against a nebula. The left image features the Canada-France-Hawaii Telescope (CFHT) unit (located atop the summit of Mauna Kea, Hawaii) set against the Eagle Nebula. 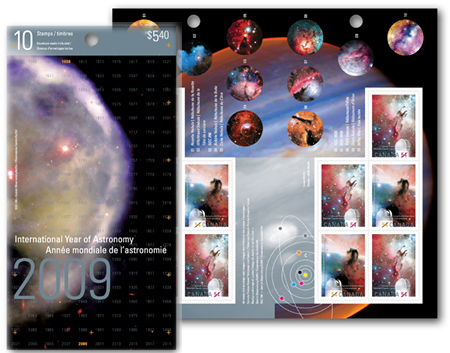 The right stamp features the National Research CouncilÕs Dominion Astrophysical Observatory (DAO) in Saanich, BC set against the Horsehead Nebula.Canada, two stamps (each valued at 0.54 CAD) feature an observatory set against a nebula. The left image features the Canada-France-Hawaii Telescope (CFHT) unit (located atop the summit of Mauna Kea, Hawaii) set against the Eagle Nebula. 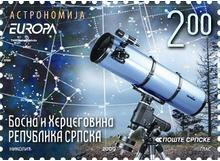 The right stamp features the National Research CouncilÕs Dominion Astrophysical Observatory (DAO) in Saanich, BC set against the Horsehead Nebula. Canada, official FDC with souvenir sheet and special "2009" postmark. Canada, montage of cover and interior of the Canada IYA stamps issued in booklet form. 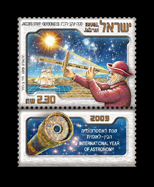 Included are envelope sealers that carry astronomical images. 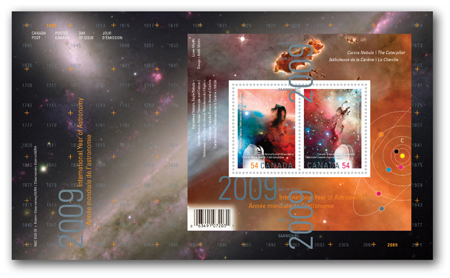 Canada, the two stamps issues combined on a souvenir sheet with selvage art depicting the Carina Nebula (the Caterpillar). 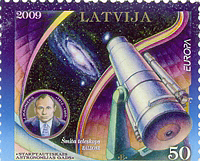 Latvia 50 LVL value depicting astronomer, telescope and galaxy. Latvia 55 LVL value with a lot of information included. 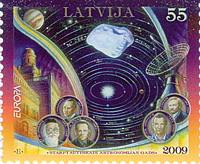 This small treasure of the printer's art (measuring only 33 x 27.5 mm) contains images of an observatory, a radio dish, five figures from Latvian astronomical history, a diagram of the solar system (out to the orbit of Jupiter) asteroid 1284 Latvia, and in the micro-printing the numerical identities of 12 other asteroids (all presumably with a Latvian connection). 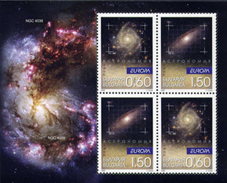 Latvia FDC displaying both stamps, special FDI postmark and cache art of spiral galaxy M51 (Andromeda.) The galaxy image of the cache art would appear to be the same image as depicted on the 50 LVL value stamp. 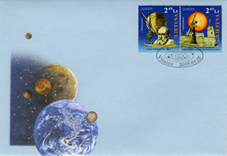 Latvian FDI postmark depicts asteroid "1284 Latvia." 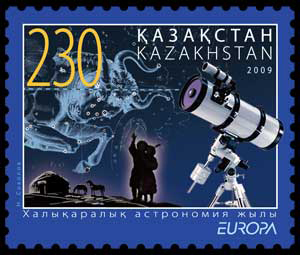 Kazakhstan stamp number two of the set valued at 230 KZT each. 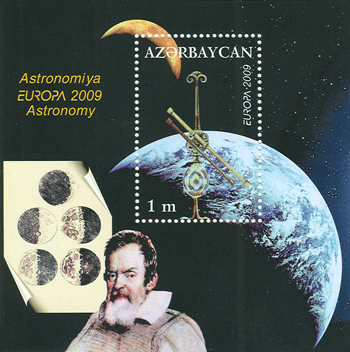 This stamp features a portrait of Galileo, several telescopes, one of Galileo's drawings of the Moon; all set against a background of a photographic image of the Moon. Kazakhstan single stamp of two stamp set, each valued at 230 KZT. This design features a telescope and a pair of figures set in a rural scene gazing at the night sky with the constellation Taurus illustrated. A nice promotion of dark sky preservation. 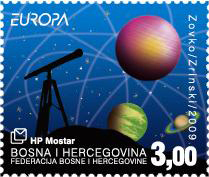 Bosnia and Herzegovina (Croat post) second design, also valued at 3 BAM features illustration of solar system and a telescope in silhouette. Bosnia and Herzegovina (Croat post) valued at 3 BAM features an illustration of a solar system. Bosnia and Herzegovina (Croat post) FDC with both designs and special FDI cancel. 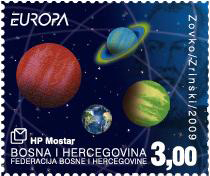 Bosnia and Herzegovina (Croat post) FDI postmark. 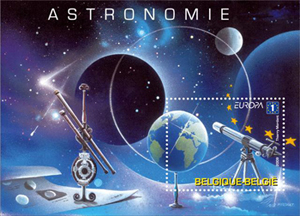 FDC from Belgium featuring their stamp issue, special FDI postmark and appropriate cache art. You may notice that the date of the cancel is two days before the actual release date. 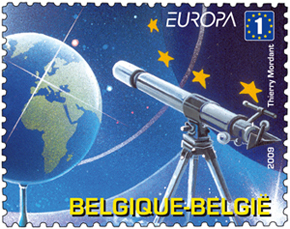 There was a preview ceremony held at the planetarium in Brussels prior to the actual public release of the stamp. 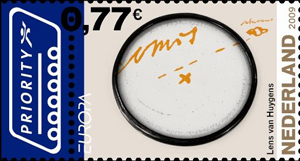 Close-up view of the stamp from Belgium seperated from its sheet. 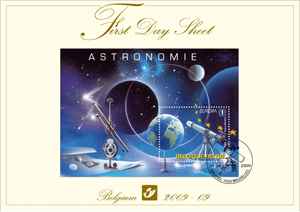 First Day Sheet from Belgium featuring their souvenir sheet with special postmark. The release from Belgium in souvenir sheet form. The design features a modern telescope, a telescope of the time of Galileo, a chart for astronomical study and a globe of the Earth: all set within a fanciful illustration of the heavens. 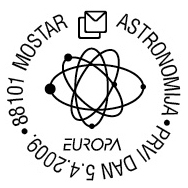 The theme of astronomy selected by PostEurop for 2009 has been widely accepted among its member nations. This acceptance has presented an under current that appears in the form dual stamp issues that present themes of ancient astronomy and modern astronomy. The releases from the Netherlands reflect that undercurrent. 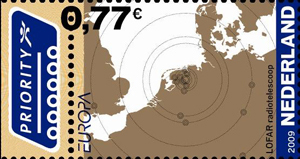 This first stamp features a diagram of the LOFAR radiotelescope with some of the sensing sites located. These types of large extended arrays are gaining ground in modern astronomy as they present the ability to effectively build a very large telescope (in the order of several kilometers in size) very economically and with minimal impact on the environment. They also are being eyed by other disciplines that can "piggy-back" on the project by placing other types of remote sensors on the platforms. 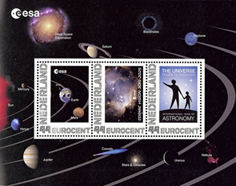 This, the second stamp from the Netherland release features the ancient aspect of astronomy. It depicts the lens (currently held in the Utrecht University Museum) through which Christiaan Huygens discovered the first of Saturn's moons, Titan. (the illustration being enlarged by the lens is from Huygens' log marking the discovery made on March 25, 1655.) Huygens observations of Saturn were instrumental in the discovery of the nature of the "rings" of Saturn, which had prior to then been thought to be appendages to the gas giant. 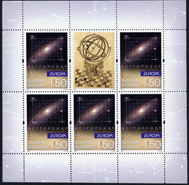 A sheet of ten stamps (2x 5 each) of the Netherland's release. 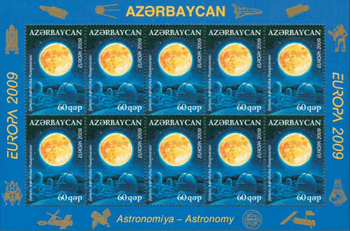 Miniature sheet features five stamps and one label. 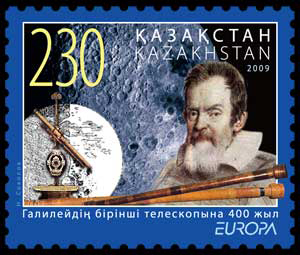 The stamps feature figures from astronomy (some or all may be depictions of Galileo) along with various instruments (globe, telescope, dividers, etc.) and numerous images of Jupiter and its moons. The sheet commemorates the IYA2009 as stated on the label. IYA2009 commemorative souvenir sheet. Selvage art depicts Thomas Harriot (whose telscopic observations preceded those of Galileo but went unpublished until later) images of the Moon, drawings/diagrams, another navigational instrument (Harriot accompanied Sir Walter Raleigh to Virginia in 1585) a couple of satellites (Luna 1 and Luna 3) all set against a backdrop of a nebula. 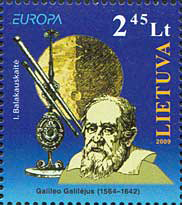 The inset stamp features an image of Galileo peering through his telescope with Jupiter and possibly two of its moons in the background. 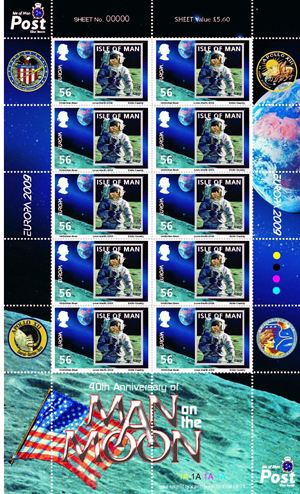 This set of six stamps, from the Isle of Man, commemorate the 40th anniversary of mankind's landing on the Moon. 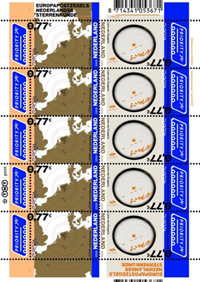 There are six values and two of the values (33p and 56p) were selected as the Isle of Man contribution to the EUROPA series and are the only two from the set that carry that logo. 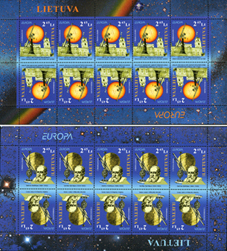 Seperate sheet styles were also devised (10 stamps per sheet versus 25 stamps per sheet for the other values) as well as seperate "EUROPA" FDCs. The series features numerous images (in the form of artist's paintings about and NASA photographs from ) the lunar explorations made during the "Apollo" mission years. 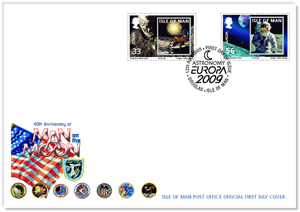 This FDC from the Isle of Man release features all six stamps , including the two values marked "EUROPA." It features its own FDI postmark. The "EUROPA" FDC from the Isle of Man release. 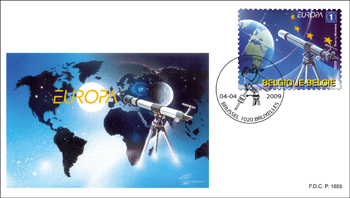 Only the two EUROPA stamps are featured and there is a separate FDI postmark as well. This image depicts the miniature sheet from the Isle of Man release. One might notice the lack of perforations. I am not sure whether this is a preliminary version of the sheet or if it actually exists imperforate. Viewer input welcomed. 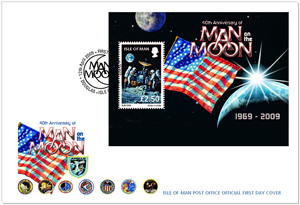 This image depicts the miniature sheet from the Isle of Man release on a FDC. 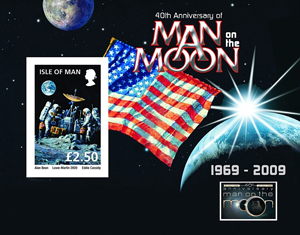 This image depicts the Isle of Man miniature sheet (again imperforate) and with an overprint marking the 40th anniversary of the manned lunar landing. 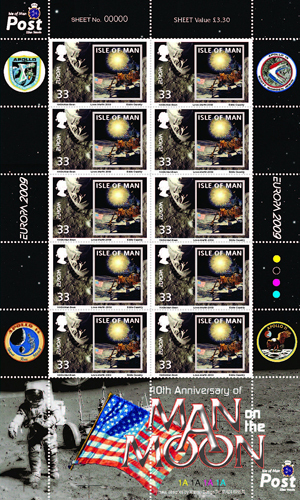 The 33p sheet from the Isle of Man EUROPA contribution. The 56p sheet from the Isle of Man EUROPA selections. 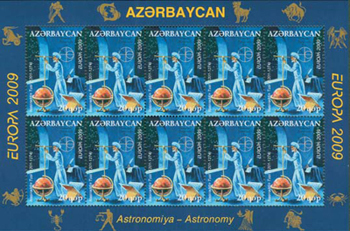 Sheet of 10 stamps (of a single design) with zodiac symbols in selvage. Booklet cover depicted two designs combined for an interesting journey across time. Sheetlet of 8 stamps (X4 each of two designs) The stamps of the booklet are printed "tête-bêche." 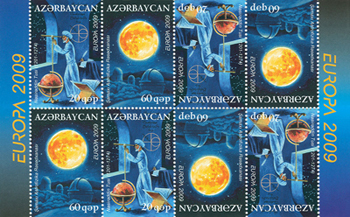 Sheet of 10 stamps (of one design) with modern space exploration items in selvage. 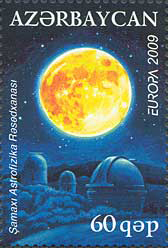 Stamp depicting Moon and cluster of domes at the Shamakhi Astrophysical Observatory. 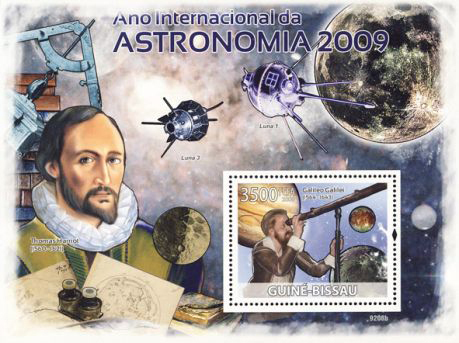 Souvenir sheet with single stamp valued at 1 m. depicting Galileo, a sheet of his lunar observational drawings, Earth, Moon and telescope. 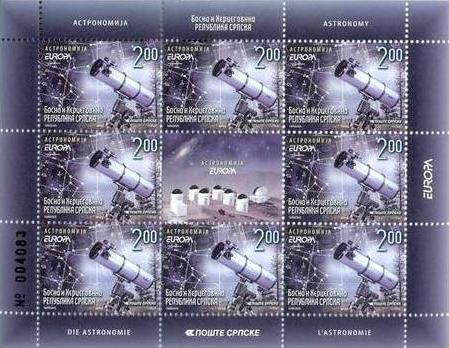 Booklet of Belarus issues. 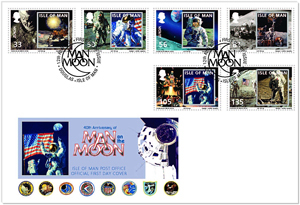 The booklet contains three stamps of each design as well as the two vignette images. 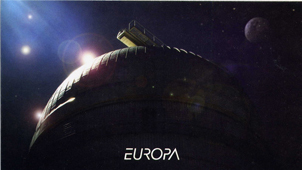 Cover from booklet of releases from Belarus. FDI postmark used on issues from Belarus. Belarus issue consists of two designs, each valued at 1000 BYR. This design features the devices of ancient astronomy and includes a telescope, dividers, an armillary sphere that overlay an illustration of the Aztec calendar. In the background are images from the zodiac. 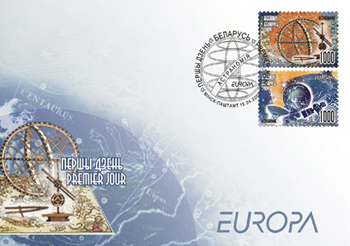 The second Belarus design, also valued at 1000 BYR, depicts elements related to modern astronomy. Included are a spacecraft and a radio dish. But it also features images of constellations. Belarus FDC containing both designs. 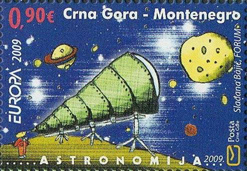 This stamp is one of four designs (2x 0.60 & 2x 0.90 ¤ in the form of one stamp design each as singles + 1 souvenir-sheet featuring two designs) issued by Montenegro. Obviously it is directed to appeal to the young (and young at heart) and I think the effort is to be applauded. 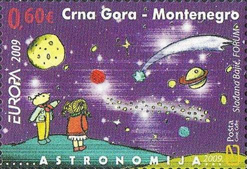 We need the younger generations to continue our pursuits in both astronomy and philately and if stamps such as these stimulate young minds to follow that path - then i say well done! 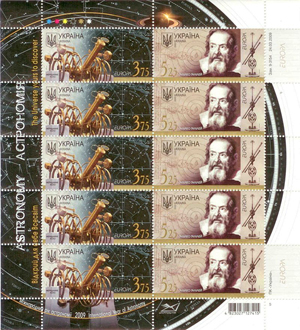 A mini-sheet of 8 stamps + vignette from the 0,60 value offering by Montenegro. This is the second design ( the 0,90 value as a single) from the Montenegro offering. 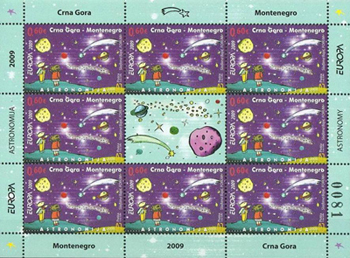 A mini-sheet of 8 stamps + vignette from the 0,90 value offering by Montenegro. 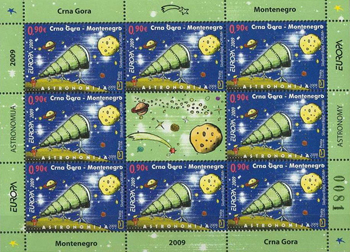 A souvenir sheet of 2 stamps with both 0,60 and 0,90 value from the offering by Montenegro. These creative stamps will surely enjoy wide appeal. 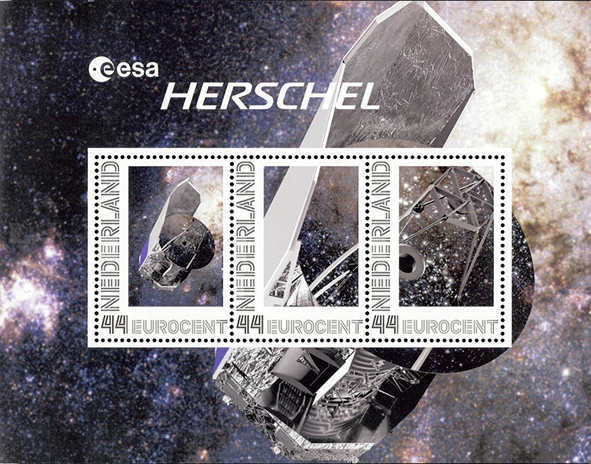 Netherlands issue depicting the Herschel telescope. Would it be possible for one with the correct skill set to determine what region of our night sky is being reflected by the mirror (provided enough information is visually presented.) The 3.5 meter diameter mirror is the largest ever produced for a space telecope. 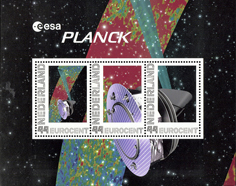 Netherlands issue commemorating the Planck mission. 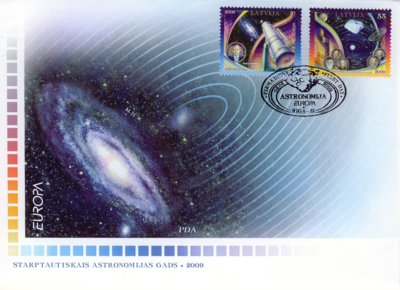 Cover of booklet within which the Herschel, Planck and solar system sheets are found. 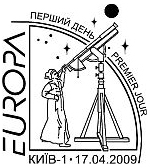 Postage Prepayment Impressions Development Directorate of USEP "Ukrposhta" - Europa 2009 ~ Astronomy issue: two stamps (3.75 & 5.25 UAH) both stamps are issued in a mini-sheet of 10 stamps (5 of each) and both stamps are issued in a booklet of 2 stamps. Stamps are bigger in the booklet than in the mini-sheet! This is a FDC from Ukraine that carries the FDI special postmark on a booklet sheet. 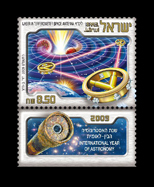 Notice how the 3.75 value image of the telescope extends beyond the stamp into the selvage. There is also the IYA logo just above the cache art which is the same image of the aforementioned telescope but with a different background. This image depicts a se-tenant pair from Ukraine. 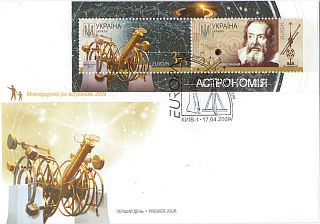 The two stamps (valued at 3.75 & 5.25 UAH) share a common theme in their commemoration of Galileo. 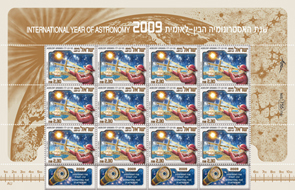 The 3.75 value depicts a telescope set against a star-filled sky with constellations marked. The 5.25 value carries a portrait of Galileo along with some of his diagrams and a telescope. 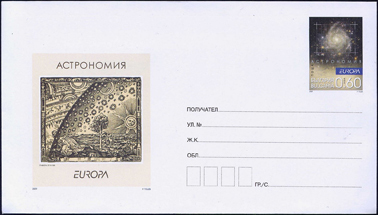 FDI postmark used by Ukraine for their EUROPA series. This is a full sheet of the Ukrainian issue. This handsome sample makes quite an impression. 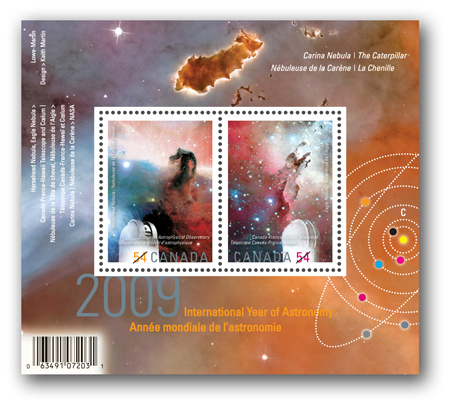 Norway - Astronomy related issue ~ Date of issue: 17April2009 / Face value: NOK 12 (A-Priority, worldwide) This is one design out of six from the "Tourist" series. It features the "aurora" as viewed from Andøya in Nordland. The most familiar of this natural phenomena is surely the Northern Lights (Aurora Borealis). This is due to the fact that the northern region of greatest activity has a much greater density of population than the southern region where the activity must be much greater to be seen outside of Antarctica. Aurora occur when positively and negatively charged particles from the sun are trapped by the earth´s magnetic field and enter its atmosphere, where they collide with neutral gaseous particles. The gas is ionized and acquires extra energy which it then loses by emitting light. This phenomenon is strongest around the Earth's magnetic poles. The Northern Lights are known as the Aurora Borealus while the same interaction at the south polar region is termed the Aurora Australis. 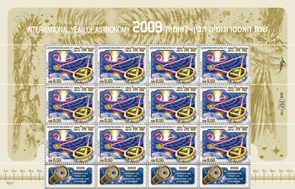 Israel Post - IYA2009 issue: Three stamps will be issued honoring the past, present and future of astronomical research. Israel, sheet of 2.30 ILS value. Israel, sheet of 3.80 ILS value. Israel, sheet of 8.50 ILS value. Israel (astronomy of the past) JacobÕs Staff: The study and mapping of the heavens began before Galileo, with the Jewish people making a unique contribution in the form of ÒJacobÕs StaffÓ ­ an ancient measurement tool for mapping stars, which was first described and in all likelihood invented by Gersonides (Rabbi Levi ben Gershon, France, 1288-1344). The staff was 1.4 meters long and notched with scale graduations along its length. Up to seven cross-pieces of varying lengths, called ÒtransomsÓ, slid up and down along the main piece. By aiming one end of the transom toward a star and sliding the transom along the notched main staff until its other end lined up with another star, one could measure the angular distance between those two stars. Navigators also made use of JacobÕs Staff to measure the altitude of the North Star above the horizon in order to determine their latitude. 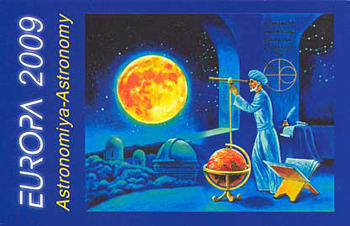 The illustration demonstrates the use of JacobÕs Staff in astronomy and navigation, by aiming the upper end of the transom to the sun or to a star and its lower end to the horizon. On the sheet margin: the Big Dipper and Little Dipper constellations and at the edge, Polaris the North Star; Earth; the Sun; a basic ÒrulerÓ whose units (AU-astronomical units) are used to measure distances within the solar system. Israel, (astronomy of the present) Gravitational Lensing: Over the years, telescopes have become a powerful research tool, and the largest among them are equipped with concave mirrors measuring 8-10 meters in diameter. The larger the mirror, the more light it captures, allowing the measurement of fainter astronomical bodies. Mirrors measuring 40 meters in diameter and more are planned for the future. But the universeÕs largest telescopes are those that exist in nature. The way in which they work was discovered by the Jewish scientist Albert Einstein, one of the most significant scientists of all time. One of his revolutionary breakthroughs in the field of physics is the General Theory of Relativity, dealing with space and time in nature. According to this theory, as light rays from a distant astronomical body pass by a massive object, the objectÕs gravitational force affects their paths and they bend. Thus, a massive body that is positioned between an observer and a distant astronomical body acts as a lens ­ the distant body appears enlarged and may even be multiplied, as a number of images appear alongside the ÒlensÓ. The phenomenon of light rays changing course due to gravitational force is called ÒGravitational LensingÓ. Gravitational lenses may be created by regular stars or by more dense astronomical bodies such as black holes, by galaxies or even by clusters of galaxies. NatureÕs largest telescopes allow us to glimpse distant galaxies and perceive light that was emitted from them more than ten billion years ago. Today, the largest ground and space telescopes photograph images of extremely distant astronomical bodies after they have undergone gravitational lensing. The illustration demonstrates gravitational lensing against the Hubble space telescope. The mass of the galaxy opposite the telescope bends the space around it, diverting the paths of light rays coming from a quasar located far behind it (a huge black hole in the center of a galaxy that emits large amounts of energy), causing them to warp around the galaxy while creating images of the quasar on either side of the galaxy. On the sheet margin: EinsteinÕs Cross (a gravitational lens with a galaxy in the center that creates four images of the quasar Q2237+030); a spiral galaxy; a basic ÒrulerÓ whose units (pc-parsecs) are used to measure distances between stars and galaxies. Israel, (the astronomy of the future) LISA ­ Laser Interferometer Space Antenna : In the future, new astronomical research fields involving the examination of radiation in spectral regions that have yet to be studied will develop. One example of this is gravitational radiation. Although its existence may be derived from EinsteinÕs General Theory of Gravity, no one has been able to detect it as yet. The future LISA system, which will comprise three spacecraft arranged at the apices of an equilateral triangle and connected by laser beams, is currently being planned to detect and measure gravitational waves. Gravitational waves warp the space surrounding the spacecraft and as a result the spacecraft will move farther away from or closer toward each other. Each pair of spacecraft will be spaced five million kilometers apart. Any miniscule change of up to one millionth of a centimeter in the length of one of the sides of the huge triangle will be measured by the laser beams emanating from the spacecraft, revealing the existence of a gravitational wave. The illustration demonstrates measuring gravity waves by using laser beams from the three satellites that comprise the LISA system. Gravity waves are emitted by the bending of space when two neutron stars orbit around each other as they approach merging. On the sheet margin: A black hole surrounded by a disc of material that is being accreted and which emits bursts of particles; gas rings emitted from the ÒeggÓ nebula; one of the gas ÒpillarsÓ in the ÒeagleÓ nebula; a basic ÒrulerÓ whose units (Mpc-megaparsecs) are used to measure large distances in the universe. 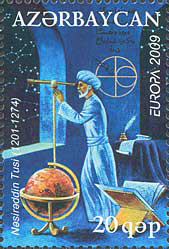 Galileo GalileiÕs telescope appears on the tabs. 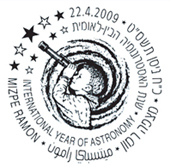 Tel-Aviv UniversityÕs Florence and George Wise Observatory, located near Mitzpe Ramon, appears on the first day cover. Israel, IYA release special FDI postmark. 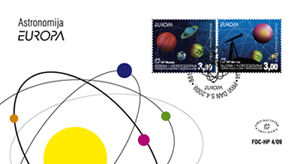 Design of the postmark used on the Spanish Andorran FDI. 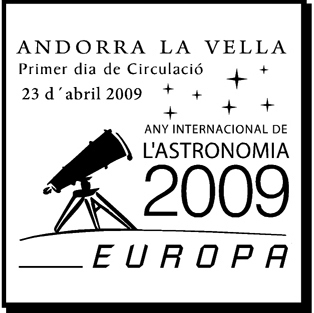 Spanish Andorra stamp (0.62 €) design is based on the IYA2009 logo. 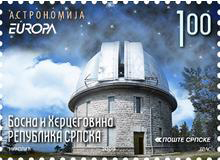 Bosnia and Herzegovina (Serb post) release valued at 1 BAM featuring an image of an observatory. 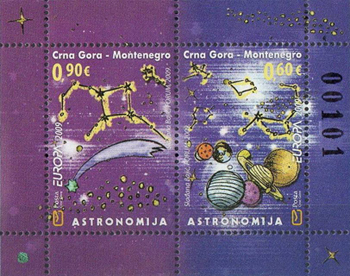 Bosnia and Herzegovina (Serb Post) mini-sheet containing 8 of the 1 BAM value stamp design and a central vignette of the solar system. Bosnia and Herzegovina (Serb post) valued at 2 BAM features an image of a modern telescope set against a chart of constellations and the night sky. 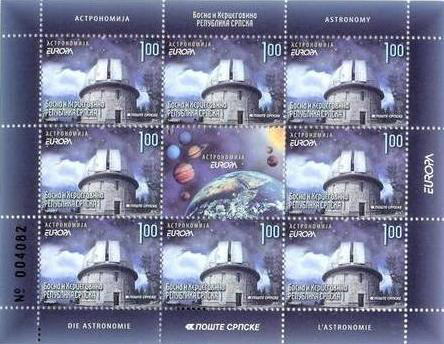 Bosnia and Herzegovina (Serb Post) sheet of the 2 BAM value contains 8 stamps and a central vignette depicting an astronomical facility. Booklet from the Bosnia and Herzegovina (Serb Post) release. 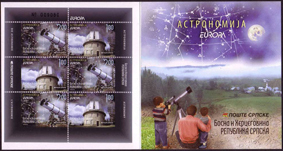 The booklet contains stamps from each design and the cover promotes the encouragement of family involvement in the discovery and observation of the wonders of the universe through astronomy. 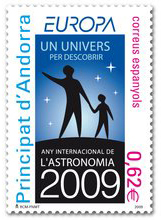 Correos y Telégrafos, S.A - Europa 2009 ~ Astronomy issue: 1 stamp (0.62 €) The stamp depicts an artistic composition featuring an image of the Moon set against a rendering of space with a beam of light. 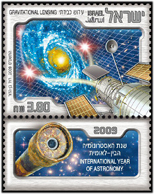 This stamp is devoted to the International Year of Astronomy. "Once in a blue Moon" might be an apt title for the EUROPA offering from Spain. The IYA logo is nicely incorporated into the FDI postmark for the Spanish issue. 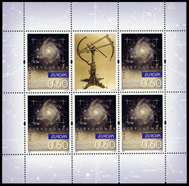 PLC Lietuvos paštas - Europa 2009 ~ Astronomy issue: two stamps (2x 2.45 LTL) both stamps are issued mini-sheets of 10 stamps, (5x2) stamps. The margins of each sheet carry appropriate inscriptions and pictures. 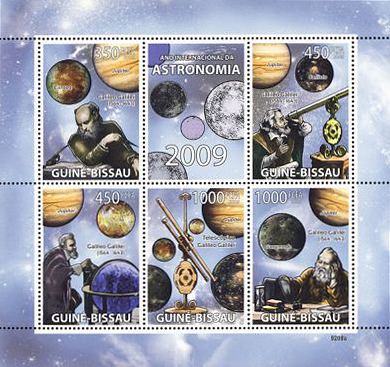 The issue is printed with the stamps têtê-bêche. Lithuania has two stamps to offer. Both are valued at 2.45 LTL. The first (shown here) depicts Galileo, a telescope and one of his drawings of the Moon. 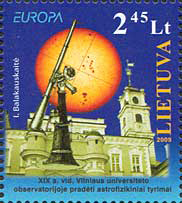 The second offering from Lithuania (seen here) depicts a telescope in the foreground, Vilnius University in the mid-ground and an image of the Sun (with sunspots) in the background. All are set against a blue field that gradiates from darker to lighter as one moves from the top of the stamp to the bottom. FDC of the stamps from Lithuania with cache art and special FDI cancel. 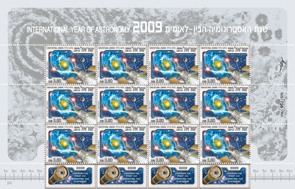 This image depicts both Lituanian stamps in their respective sheet variety. 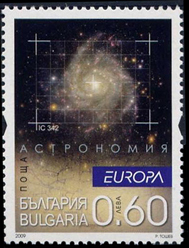 Bulgaria, this stamp (the 0.60 BGN value) features IC 342. And if variety of format is your desire then this is the release for you. They come in singles, miniature sheets, booklets, souvenir sheets and even postcards. They also have size and perforation varieties. 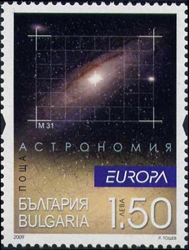 Bulgaria, this stamp (the 1.50 BGN value) features galaxy M31. This image shows comparison images to illustrate the size and perforation differences between the sheet and booklet forms. Sheet forms on the left and booklet forms on the right. Bulgaria mini-sheet of 0.60 value + one vignette. Bulgaria, postcard format featuring the 0.60 value and an interesting cache illustration. 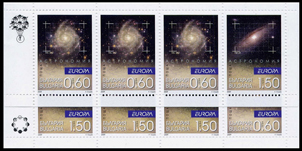 Bulgaria, souvenir sheet with four stamps (2 + 2 designs) and featuring selvage art NGC 4038 and NGC 4039.